Debra Gould Home Collection — Paintings, floorcloths and other home accessories designed by Debra Gould. Floorcloth from the 'Wild Things"collection. Welcome to the Debra Gould Home Collection, featuring: floorcloths, paintings, table runners, place mats, clocks, mirrors, side tables, jewelry boxes and more. No two pieces are exactly alike and all are signed by artist Debra Gould. Bringing together six elements — energy, form, style, design, color and passion— her unique work is collected around the world, and been featured on TV and in print. Being surrounded by objects that you really relate to is what helps makes your house a home. It brings energy to your environment and allows you to showcase some of your own passions. Handcrafted items are also often conversation pieces. This collection demonstrates a range of styles. 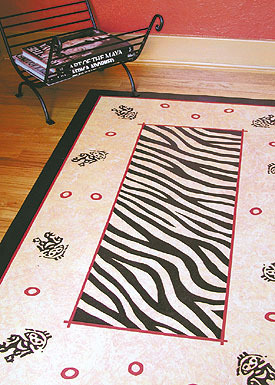 Any item can be customized to suit your colors, fabric or tiles. These hand painted works can also incorporate a line from your favorite poem, or build your child’s name and birth date into the design. Custom orders can also commemorate a wedding, anniversary, graduation or other special event. Perhaps you would like to read what Clients have to say about the work they have commissioned. If you would like additional information, e-mail Debra or call 416-691-6615. Any feedback on this site is always welcome, since new things are added or changed on a regular basis.